Re-designed shades and blinds experience makes it even easier to control shading products throughout their home. Create groups for easy one-touch control of all the shades in a room! Press and hold to quickly drill down into controlling one shade in a group. 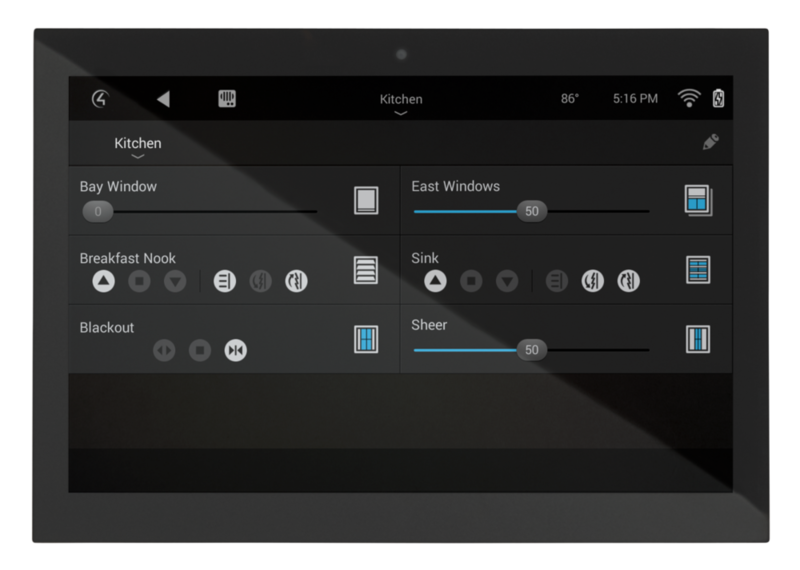 More sophisticated controls for blinds, including tilt. New integrations with leading shading manufacturers makes it easier to add into any project. New Custom Experience Buttons add more features to the touch screen, mobile and on-screen display. New icons include sprinklers, fountains, fireplaces, fans, and more. Providing new levels of personalization, now you can create your own Wake Up and Sleep scenes right on your touch screen. Every room in the home can create their own scene that includes lights, shades, music or TV, and the thermostat. Now you can have one-tap access to the Control4 App on the face of your Apple Watch with the new complication. Simply add the Control4 App to the Apple Watch and then add the complication. As an added bonus, the Apple Watch Digital Crown also includes the ability to dim and raise Control4 lighting devices. Enhancing Control4 Lighting, Comfort and Security solutions, EA Series Controllers are now Z-Wave Certified. NEW CONTROL4 DOOR STATION IN BLACK!